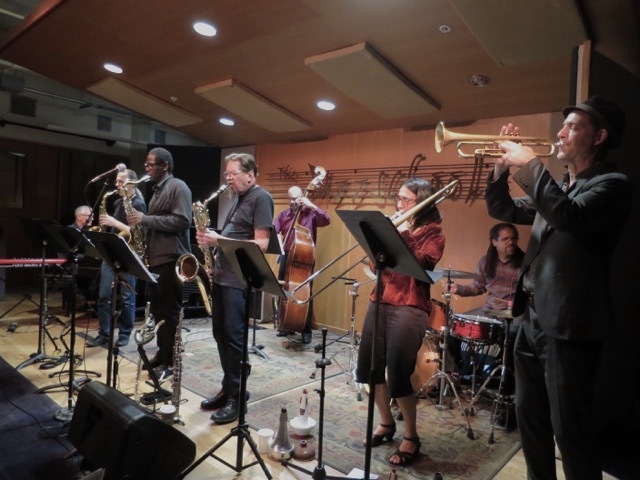 Little Big Band pays tribute to the great Duke Ellington Orchestra in honor of his 120th birth anniversary. Arranger David Slusser attempts to capture the essence and magic by deploying his talented crew with one ear toward emulation and the other toward innovation. Great soloists weave in and out of the supporting ensemble. Some material is familiar, others recast; plus overlooked gems brought to light. Skywalker Sound in Marin County in the film sound profession. He has worked often as a music editor for directors Francis Coppola, George Lucas (1993 Emmy for Sound Editing) and David Lynch, with whom he has co-composed music for his films. On his own he has composed for documentaries and public radio, as well as his jazz group Rubber City, co-founded with the late Ralph Carney. His sound design is in the collections of both the Museum of Modern Art in New York and the Museum of Contempory Art in Los Angeles, though heard far more often in 90s television commercials. He began an association with composer John Zorn in the mid 80s, touring and contributing to recordings. Two prizes in the 1999 Julius Hemphill Composition Awards went to Slusser, including First Prize for jazz orchestra.